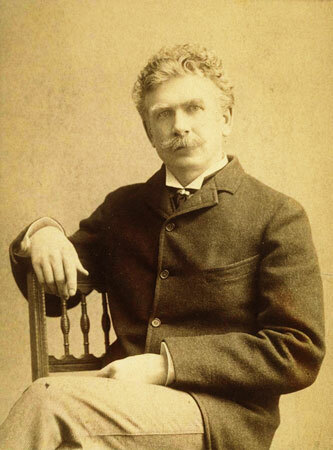 An 1892 photo of Ambrose Gwinnett Bierce: short-story writer, satirist, and editor of the San Francisco Examiner . On October 14, 1888, a page-long article appeared in the "Sunday Supplement" of the San Francisco Examiner . Titled simply "WHITHER?" it told several stories of people who had literally vanished into the air without leaving a trace; in most cases, these disappearances occurred in front of eyewitnesses. The first story is of a Selma, Alabama, farmer named Williamson, who one autumn day in 1854 disappeared while crossing a field in full view of his wife, child, and several neighbours. The ensuing search found that there were no holes in the earth into which he could have sunk, no buildings where he might have hidden—in short, no place he could be at all. Eventually, he was declared legally dead. The second story is of an Englishman named James Burne Worson, who vanished while running a footrace. The third is the story of Charles Ashmore, who went out one winter night to get water from the well and never returned. His family, searching for him, found only a single row of footprints in the snow. The footprints ended abruptly with no sign of what had happened to the boy. Several months later, they heard a faint voice crying out from the patch of ground where the last footprints had been, a voice which they recognized as his. Over the weeks it grew fainter and fainter, and gradually disappeared altogether. At the end is a summary explanation of what might have happened to these people, as supposedly described by a "Dr. Hern of Leipsic." Briefly, the theory is that they disappeared into cavities or voids in the "luminiferous ether" which pervaded the universe, and that as a result they were trapped forever in the equivalent of a time-warped sensory deprivation chamber: "A man inclosed in such a closet could neither see nor be seen; neither hear nor be heard; neither feel nor be felt; neither live nor die, for both life and death are processes which can take place only where there is force, and in empty space no force could exist." The piece was signed by "A.G.B." Readers of the Examiner would know who this was—the paper's editor, Ambrose Gwinnett Bierce. The article is written in a fluent, journalistic style, full of exact names, places, and dates. The disappearance of Charles Ashmore, for example, is pinpointed "On the evening of the 9th of November in 1878, at about nine o'clock," and the location given as Quincy, Illinois. The story of Williamson is largely taken up with supposedly verbatim extracts from the testimony of a neighbour, complete with markings of "[sic]" after the neighbour's grammatical errors. There was nothing in or around the article overtly denoting it as fictional, though there were several clues which could easily be overlooked. One clue was context: "WHITHER?" was surrounded by articles on Lilly Langtry's impending visit, the new Gilbert & Sullivan operetta The Yeoman of the Guard , and similar items which fell more under the heading of entertainment than hard news. The second was a passage at the end of the article which may or may not have been a deliberate clue. Having spent the article speculating on the fates of Charles Ashmore, Williamson, and James Burne Worson, Bierce concludes the section on "Dr. Hern's" theory of cavities in luminiferous ether by wondering, "Are these the awful conditions (some will ask) under which the parents of Charley Ross and Annie Mooney are to think of their children as existing, and doomed forever to exist?" Charley Ross and Annie Mooney appear nowhere else in the article, and it is reasonable to speculate that Bierce either changed the names of some characters in his stories or else deleted some extra disappearance stories and forgot to follow through on the cut. What is especially curious is that unlike everyone else named in the story, Charley Ross was undoubtedly a real missing person; four-year-old Charley was kidnapped by two men from his Pennsylvania home in 1874. Ransom notes were received but although the men were found and killed in the course of committing a burglary, Charley was never seen again. Bierce would certainly have known about this case, as Charley Ross was the first child to be kidnapped for ransom and his story became notorious throughout the country. However, there was never the slightest suggestion that his disappearance was supernatural, so why Bierce would have used his name in that context is impossible to unravel. But whatever their provenance, the appearance of these otherwise-unmentioned names at the end might have been enough for an alert reader to realize that the contents of the article were not to be taken as unchallenged fact. To a casual reader, however, the story would appear to be based on true accounts, and it is very likely that Bierce was making a little journalistic mischief—not uncommon a hundred years ago and known to occur since then. These stories were later anthologized in virtually unchanged form in Bierce's short story collection Can Such Things Be? , which came out in 1893 and had a lukewarm reception, despite containing several stories which went on to become regular features in horror anthologies. The three "vanishing" stories were printed at the very end of the book, in their own subsection entitled "MYSTERIOUS DISAPPEARANCES," under the titles of "The Difficulty of Crossing a Field," "An Unfinished Race," and "Charles Ashmore's Trail." The reference to Charley Ross and Annie Mooney vanished (appropriately enough) and if there were any separate, unpublished stories about them, it is unlikely that they have survived. Then something rather odd happened; although Bierce's book sank with a few ripples, two of the "Mysterious Disappearances" had meanwhile begun to take on lives of their own, masquerading as true unsolved mysteries, with names and locations changing but the cores of the stories remaining the same. "Charles Ashmore's Trail" will probably be recognized by many, though under a different name and with some minor variations in the story itself. In fact, it is possible that as a result of the story's first appearance in the Examiner , it had both taken root as a legend and been long detached from Bierce's name several years before Can Such Things Be? was published. According to Algernon Blackwood, he was told a story similar to Charles Ashmore's while he was running a dairy farm in New York. Blackwood's time as a dairy farmer was brief, from 1890 to 1891, and Can Such Things Be? was not published until 1893. By Blackwood's account, it was a Texas dairy farmer who told him the story. The farmer's story was that one snowy night during his childhood, his older brother Jim had gone out to get water from the well, and had never been seen again. The family had gone out to search for him, and heard his cries, and saw the single set of footprints in the snow. His brother was never found. Blackwood's story "Entrance and Exit," which was based on the "incident," appeared in 1914—incidentally, the year in which Bierce disappeared and presumably died, most likely while observing the Mexican Revolution. Blackwood's story, like the story of "Jim," bears a heavy resemblance to that of the original Charles Ashmore, except for the victim's un-Bierce-like cries of "Pray for me!" on disappearing and his reappearance at the end. This is the first printed reference Blackwood made to the disappearance story. Years later, in 1945, he would tell the story during a radio talk and be accused of plagiarizing Bierce. According to Blackwood's biographer, Mike Ashley, Blackwood's position was that he and Bierce had both taken the story from the mysterious "real" incident, and it was then that Blackwood related the story he had heard in 1890-1891. This is possibly an early sighting of the mutated Bierce story. It is possible, of course, that Blackwood was lying or misremembering, but it is just as likely that somebody really did tell him the story as truth. Five minutes after Oliver had gone out with his bucket, the guests heard him shout for help. They rushed to the back of the house. There they heard again the cries for help, but young Lerch himself was nowhere to be seen. The cries seemed to come from the air above them. "Oliver, where are you?" shouted his father. The answer came from a spot directly over his head and apparently about one hundred feet in the air. At this, most of the guests bolted in terror. . . . The cries were those of one who is being carried further and further away—not one who is growing weaker. Nothing more was ever known of Oliver Lerch. [After supper] Mrs. Currie told the strange tale of the Disappearance of Oliver Lurch. He was a farm youth in Kentucky who had gone out one night from a gathering just like ours, to fetch some wood for the fire, had not returned, and when the others went to seek him he could be heard calling from the sky, "Here I am! Here I am! Help me! I am Oliver Lurch!" The cries became fainter and fainter, and Oliver was heard and seen no more. There were those who said he had been carried off by a great eagle, but—a grown man? What sort of eagle was that? It must have been Something Else. I fell asleep that night fearing the Mighty Clutch. And since then I have always felt that any party would be the better for a ghost story. Davies was casting his memory back very far, but unlike some others he had no stake in proving the timeline—or the reality—of the Lerch story. He mentioned it only as a humourous item to begin the introduction of his own book of ghost stories, so his memory can probably be trusted. The basic story itself is almost unchanged from the 1906 rendition. The whispering voice from the ground has been traded in for the screaming voice from above, and the name no longer even resembles Charles Ashmore but the essence is recognizable as Bierce's story. The story of Oliver was obviously on its way to becoming a favorite spook story; according to John Fischer and Joe Nickell, Oliver Lerch at one point became sufficiently well identified with South Bend that in 1932 an editor of the South Bend Tribune wrote a specific denial that the "real" Oliver Lerch incident had occurred in that town. Unbowed by this rebuke, Oliver Lerch appeared many times over the next eighty years, often in anthologies of supernatural stories for children. The name sometimes differs but the essence—the single trail of footprints, the complete vanishing, the cries for help—is unchanged. The progression of the Charles Ashmore / Oliver Lerch story, while interesting to track, is not in itself unique. Hoax news stories are very common and, while it cannot be absolutely proven that Bierce intended it as a real hoax (he did put the story in the entertainment section, after all, not the on the front page), even overtly fictional stories have been known to take flight in the public imagination and Bierce's stories were by no means obviously made up. As Oliver Lerch's story demonstrates, it can be unwise to rely much even on supposedly firsthand or eyewitness testimony. (The mysterious brother of the Texas farmer is untraceable.) This is dramatically proven in the much more unusual evolution of the first story in Bierce's triad, which seems to have been ignored by popular folklore for half a century after its first appearance, then brought forward again as real, then debunked—and then resurrected once more, with an additional complicating twist. When Williamson made his next appearance, his name too had changed: it was now David Lang. Many people have heard of the David Lang story and many, too, have heard of the story's debunking. Briefly put, the whole business began in 1953, when an article was published in Fate magazine. The author, Stuart Palmer, claimed to be passing on a true story told to him several decades earlier by Sarah Lang, daughter of David. It described a disappearance very much like Bierce's Williamson, witnesses and all, except that the incident had been relocated to Gallatin, Tennessee, in 1880, and it contained an added element which would have sounded familiar to Charles Ashmore. A circle of dead grass gradually appeared on the spot where Lang disappeared, and for a while his family were able to hear him whispering there. Gradually the whispers faded, and the distraught family lived out their lives with no idea of what had happened to their father (until the now-aged Sarah contacted him via spiritualism and discovered that he was well and happy but, needless to say, no longer a resident of Tennessee). In an interesting twist, "Sarah" also mentioned that one Ambrose Bierce had heard the story of her father's disappearance and had fictionalized it later on in one of his books. The story of David Lang remained a well-known, if somewhat shaky, "true disappearance" until being debunked by 1976 by Bob Rickard and Robert Forrest. In the course of investigation for an article in The Fortean Times , they were unable to find any documentary evidence that the Lang family had existed at all and no contemporary account of their disappearance—none at all, in fact, until Palmer's article in 1953. In 1977, Fate published a retraction of the story, entitled "David Lang Vanishes . . . FOREVER." But the disappearing-farmer story was too good to disappear, as Fate optimistically put it, FOREVER. The very next year Lang was resurrected once more—as Williamson, the name originally given to Bierce's disappearing farmer. Jay Robert Nash's 1978 book Among The Missing , which bills itself as "An Anecdotal History" of disappearances, debunked David Lang but then proceeded to the surprising claim that there had been a real disappearance like Lang's: that of one Orion Williamson, who disappeared in Selma, Alabama, in 1854. Nash's account is an almost word-for-word retelling of Bierce's, though cut and altered slightly, and his final word on the affair, after telling his readers that research has verified the existence of Williamson, was that "Orion Williamson was no figment of the imagination but a real, live resident of Selma, Alabama—until, of course, he slipped into eternal mystery" ( Among The Missing , p. 330). "Dr. Maximilian Hern of Leipzig" is cited again as the proponent of the theory of disappearance into ether. The David Lang story is described being a twist on the "real" story, invented by a travelling salesman and notorious liar named Joe McHatten. Nash, like Palmer, acknowledges the Williamson story's connection to Bierce but again makes him the transmitter, rather than the inventor, of the story. "Ambrose Bierce thought the whole thing farcical," he says, "and wrote a satire about the odd happening." In fact, Williamson is not the only Bierce creation to appear in this chapter of Nash's book; Oliver Lerch, now with his original name of Charles Ashmore, is resurrected in his original form once more along with James Burne Worson, the disappearing runner whose story had until then been the only one of the trio of "vanishings" not to attain urban legend status. It is perhaps overly stringent to expect a book that bills itself as "An Anecdotal History" to hew too closely to the grain of proven fact. It is possible that Nash believed these stories to be true; Garth Haslam, in his Anomalies article, says that his 1909 edition of Can Such Things Be? contains a preface by Bierce saying that the disappearance stories are factual. However, this does not account for the additional information, especially first names, which Nash unearths for Williamson and "Dr. Hern of Leipsic," nor for his claim that Williamson's reality had been verified by record searches in Alabama. And there is the important fact that Nash has himself admitted to "seeding" his books with misinformation to prevent their being copied by other writers. This odd device is somewhat reminiscent of mapmakers planting false cul-de-sacs on their maps but also renders his books problematic unless one verifies their facts in other sources. It is for this reason that his books are not permitted to be cited as sole sources on Wikipedia , though they are fascinating and have much undoubted good information in them. But Among the Missing is listed as nonfiction, and the vast majority of the cases it describes are real ones. Orion Williamson, Charles Ashmore, and James Burne Worson are surrounded by such undoubtedly real vanished people as Judge Crater, Amelia Earhart, and Dorothy Arnold. Inevitably, the claim of Williamson's reality caught the attention of skeptics, who were quick to investigate. Joe Nickell's Secrets of the Supernatural describes his attempts to verify the existence of anyone named in connection with the Williamson story: Williamson, a neighbour named Armour Wren, or Dr. Hern. "A search of standard reference sources including biographical dictionaries (particularly German ones), together with a bibliographic search, failed to substantiate either the existence of 'Dr. Hern' or his supposed treatise," writes Nickell. He further writes that he "failed to document the existence of either 'Orion Williamson' or 'Armour Wren.' Mr. Nash failed to reply to my challenge that he either prove his claims or at least clarify how he obtained his information" (pp. 67-68). Since researching this story has, if nothing else, taught me that relying on secondary sources is not always wise, I made my own search for these people; contemporary newspapers and, more importantly, contemporary census records turned up nothing. I was not able to make contact with Mr. Nickell. Continuing his account, he suggests that the name Orion was chosen because one version of the Orion myth has the man sinking into the ground after being stung by a scorpion—but it is not necessary to go so far. Census records will inevitably miss somebody and newspapers are not infallible, so it is not possible to say absolutely that Williamson never existed, but the absolute lack of remark on this strange event—together with Nash's admitted penchant for putting misinformation in his books—all point to Williamson's existence—to say nothing of Ashmore's/Lerch's and Worson's—originating inside the head of Ambrose Bierce. But there is still a mysterious tag to the story. What about McHatten, who supposedly first spun the story of David Lang? This suggestion did not originate with Nash; according to Garth Haslam, a librarian named Hershel Payne told the Fortean Times researchers that he thought that this notorious teller of tall tales might have been the first to put on a local spin on Bierce's story and pass it on to Stuart Palmer. It's an interesting claim, but dubious. First of all, McHatten's real name, not to mention his existence, are a matter of debate. Payne refers to him as Joe Mulhatten, and Curtis MacDougall in his book Hoaxes refers to "Joseph Mulholland, a travelling salesman of Washington, Pennsylvania," who may have been the original for the semi-legendary Mulhatten and "who wrote under the pseudonym of Orange Blossom in the eighties and nineties and read his semiplausible yarns in many a serious publication, principally the Philadelphia Public Ledger " (p. 5). MacDougall's book was published in 1940. It is notable that throughout the book he never mentions Williamson, Lang, or any variation of the story at all, which suggests that the story was not then current and did not become so until Palmer's article in Fate . Certainly Mulholland is not credited with telling anything like that. In fact, his crowning achievement sounds altogether less memorable. "Among the most fantastic of Orange Blossom's stories," writes MacDougall, "was of a blazing meteor which fell in Western Pennsylvania, spreading havoc and setting fire to a large portion of the country. Ultimately, according to the Ledger , his signature 'came to be known as a sign-manual of a modern Munchausen and his stories were read as the entertaining product of a brilliant imagination and nothing more'" (p. 5). Just like Williamson's existence (which is less credible, however), Mulhatten/Mulholland's involvement is not absolutely disprovable. MacDougall's history, though good, is not exhaustive and it is entirely possible that something was dropped or that he simply didn't hear of it. He does not mention Oliver Lerch, for example, whose story was certainly current by then, though he might have classified Lerch as more of a legend than a hoax, as the story does not seem to have become identified with any particular inventor, the way Lang became associated with Stuart Palmer and (in retrospect) Joe Mulhatten/Mulholland. If "Orange Blossom" wrote yarns for newspapers, it's very possible that he did retell Bierce's story in another form. It was not possible for me even to acquire microfilms of the Ledger from those decades, much less read through them, so I cannot say that a Lang/Williamson item is not passed off in there by Orange Blossom. There is even a slim but real chance that Orange Blossom might have published the item first and that Bierce took it from him. But there are strong provisional arguments against both of these situations. First of all, Bierce, though he had many faults, was not a plagiarist (in fact, the only accusations that he stole the story have come through others' efforts to show that the Williamson/Lang stories were in fact true). He did not in his lifetime have a reputation for stealing other people's material, and furthermore he was well established as a writer of original fiction. It seems unlikely that he would have appropriated a hoax story from the other side of the country; he had enough imagination to write his own. There is a chance that like Algernon Blackwood, Andre Norton, and others, Bierce also seized on a floating urban legend and fictionalized it. It can never be proved that he did not. Even if every bit of printed matter he ever read was examined and found not to contain the story, there would always be the chance that he had heard it in a conversation or some such. Such an earlier, pre-Bierce version may one day appear (perhaps even, in a long shot, written by Orange Blossom), but for now the simplest hypothesis is that Bierce was its sole or at least primary inventor. Secondly, Stuart Palmer himself never mentions Mulhatten but does mention Bierce, when Palmer has Sarah Lang say that Bierce took and changed her father's story for Bierce's own purposes. Also, the David Lang story mixes elements from two of the vanishing stories; the disappearance while crossing a field is from the Williamson story but the voice out of the ground is straight from Charles Ashmore. Again, it could have happened that someone else mixed them and then passed them on to Palmer, who then traced them back to Bierce, but the likeliest scenario is the most straightforward: Palmer read the stories in Bierce's book, took one and added a dash of spice from the other, and then sent the result off to Fate . And the rest was urban legend history. It is difficult to read the twists and doublings-back of these two stories without wondering what Bierce would have thought. Probably he would have been grimly amused at how long and far his joke of 1888 travelled. The dissociation of these two stories from his name and their entrance into urban legend means that many American children have unknowingly become acquainted with Ambrose Bierce's fiction well before the obligatory high school reading of "An Occurrence at Owl Creek Bridge." However, after almost a century's dissociation, it seems that Bierce's original stories are slowly becoming rejoined with his name again. On March 22, 2002, a one-act opera called The Difficulty of Crossing a Field premiered at the Theatre Artaud in San Francisco. The story was Bierce's original but the opera itself, as Andante magazine reports, was a distinctly modern take; Williamson's status as a slaveholder is emphasized, as is Mrs. Williamson's loss of identity as a married woman. But perhaps the best touch of all is one that does not appear onstage. The composer, writes Eric Valliere, "create[s] an eerily hypnotic atmosphere filled with tension and foreboding." It seems only appropriate that the story of Williamson would should be restored to its original, credited status by a composer whose name is David Lang. I owe a great debt to Mike Ashley, author of Algernon Blackwood: An Extraordinary Life , who put me on the track of both Bierce's original newspaper article and the Scrap Book item. Mr. Ashley, in correspondence, made an interesting comparison between these stories and the story of the Angels of Mons, another instance of a journalistically written fiction (in this case by Arthur Machen) which numerous people claimed to have really seen. Ashley, Michael. Algernon Blackwood: An Extraordinary Life . New York: Carroll & Graf. 2001. Bierce, Ambrose. Can Such Things Be? New York: Albert and Charles Boni. 1924. This was originally published in 1893. Garth Haslam says that his edition, which is from 1909, has a preface to "Mysterious Disappearances" which says that the stories were true to the best of Bierce's knowledge. My edition doesn't have this foreword, and I haven't been able to find a copy of the 1909. Given the utter lack of evidence, we can safely assume that, as with Bierce's "Science to the Front" epilogue, he was being mischievous. Bierce, Ambrose (as A.G.B.). "WHITHER?" San Francisco Examiner , 14 October 1888, p. 9 (first page of the "Sunday Supplement"). Blackwood, Algernon. Tales of the Uncanny and Supernatural . n.p. : Castle Books. 1974. This book contains the story "Entrance And Exit," which draws noticeable elements from Bierce's story. Davies, Robertson. High Spirits: A Collection of Ghost Stories . New York: Viking Press. 1982. In the introduction, Davies says that he heard the story of Oliver Lerch c. 1918. Eberhart, George. A Geo-Bibliography of Anomalies: Primary Access to Observations of UFOs, Ghosts, and Other Mysterious Phenomena . Westport, CT: Greenwood Press. 1980. This lists anomalies by region and states whether or not they were found to be hoaxes. Lerch and Lang both make an appearance and are noted as having been debunked; Williamson, Ashmore, and Worson do not appear. "Fortean Corrigenda: The Disappearance of David Lang." Fortean Times , October 1976 (#18). Haslam, Garth. "The Mystery Of David Lang." At Anomalies , http://anomalyinfo.com/articles/sa00010.shtml. An invaluable article about the origin and permutations of the David Lang story. In the "Notes" section, you can read Bierce's original three "Vanishing" stories. Haslam's bibliography also lists numerous books which present the "vanishing" stories as fact. Larsen, Anita. Lost . . . and Never Found . New York: Scholastic. 1985. Presents Lang as false but Williamson as fact. MacDougall, Curtis Daniel. Hoaxes . New York: Dover Publications. 1958. First published in 1940, this book gives the earliest information on "Orange Blossom" that I've found. Morris, Roy Jr. Ambrose Bierce: Alone in Bad Company . New York: Oxford University Press. 1998. A good standard biography of Bierce; Can Such Things Be? is only briefly mentioned and any account of a "real" disappearance which Bierce investigated is notably absent. Nash, Jay Robert. Among The Missing: An Anecdotal History of Missing Persons from 1800 to the Present . New York: Simon & Schuster. 1978. Nash, Jay Robert. Encyclopedia of World Crime . Wilmette, IL: CrimeBooks, Inc. 1989. On the copyright page, it is stated that all volumes of the encyclopedia "have been seeded with information to detect any unauthorized use or duplication of editorial materials." Nickell, Joe, with John F. Fischer. Secrets of the Supernatural: Investigating the World's Occult Mysteries . Buffalo: Prometheus Books. 1988. Goes over the Lerch/Ashmore and Lang/Williamson stories, reaching much the same conclusion. Nickell cites the first printed reference to Oliver Lerch as appearing in 1932. He might not have been aware of the Scrap Book article. Palmer, Stuart. "How Lost Was My Father?" Fate , July 1953 (No. 40). The first appearance of David Lang. Schadewald, Robert. "David Lang Vanishes . . . FOREVER." Fate , December 1977 (No. 333). Snow, Michael. "Author threatens to sue, deemed unfit as source." Wikipedia , Wikipedia Signpost, April 24, 2006. The link is http://en.wikipedia.org/wiki/Wikipedia:Wikipedia Signpost/2006-04-24/Jay Robert_Nash. Taylor, Troy. "Can Such Things Be? The Riddle Of Orion Williamson And The Strange Mystery Of Ambrose Bierce." On the Prairie Ghosts website, http://www.prairieghosts.com/bierce.html. This site almost certainly got its information from Nash, as it uses his first names for Williamson and Hern, though one riddle is why Williamson is pronounced real while Charles Ashmore and James Worson are not. "Stories of Strange Disappearances." The Scrap Book , Vol. II, No. 3 (November 1906). Waters, Sally G. "Encyclopedia of World Crime, by Jay Robert Nash" (review). Library Journal , 1990. This review is in the "Editorial Reviews" section on Amazon: http://www.amazon.com/gp/product/0923582002. This is the book which is author-described as "seeded" with misinformation to prevent plagiarism. Zierold, Norman. Little Charley Ross: America's First Kidnapping For Ransom . Boston: Little, Brown & Co. 1967. Interesting and horrifying in itself, the Charley Ross kidnapping was the forerunner to today's kidnapping victims whose names become household words thousands of miles from where they disappeared. It is impossible to confirm Bierce's knowledge of the case but is reasonable to suppose it, as Bierce was a newspaperman and the Charley Ross—case, as well as legions of claimants saying that they were Charley Ross—were journalistic staples in much the same way as the Lindbergh baby kidnapping and claimants would be 60 years later. Marian Kensler lives in Salt Lake City. Her previous articles for Strange Horizons are "Do No Harm to Me or Mine: The Haunted History of Christmas Eve" and "May You Die in Horrible Agony: A Brief History of Curses in the Western World." Her work has also appeared in The Book of Dark Wisdom , Flashquake , and The First Line .